Manipal Hospital gets coveted accreditation for quality service in over 50 specialities. Bangalore, February 16, 2008 : - Bangaloreans have yet another reassurance for having access to quality healthcare at their preferred Manipal Hospital. The hospital has been accredited by National Accreditation Board for Hospitals (NABH) for the delivery of high quality of patient care in more than 50 specialities. Manipal Hospital, Bangalore has always been known for providing quality healthcare to patients. The formation of a dedicated quality management system four years ago also saw a series of formal recognition coming the hospital's way. It was the first Indian multi-super speciality hospital to attain ISO certification for Clinical, Nursing, Diagnostics and allied areas. 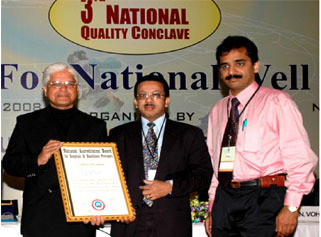 It was also the first ever recipient of the Golden Peacock National Quality Award. It is little wonder then, that a hospital where quality is part of its culture should get the coveted NABH recognition in a single assessment. That too for over 50 specialties that the hospital offers. Mr. R. Basil, MD and CEO of Manipal Health Systems and Dr. Murali Srinivas, Consultant Neurology and Advisor Quality at Manipal Hospital Bangalore received the accreditation, instituted by Quality Council of India (QCI) from Shri Ashwani Kumar, Honorable Minister of State, Ministry of Commerce and Industry, Govt of India, in New Delhi today. NABH is a constituent board of QCI, set up to establish and operate accreditation programme for healthcare organizations. The board is structured to cater to the much desired needs of the consumers and to set benchmarks for progress of the health industry. In a NABH accredited hospital, there is strong focus on patient rights and benefits, patient safety, control and prevention of infections in hospitals and practising good patient care protocols like special care for vulnerable groups, critically ill patients and better and controlled clinical outcome. Manipal Hospital with its sound system-based operations and structured process improvement programme, met all the criteria set by NABH. The assessment of a hospital is done against 500 criteria set by it. The NABH standards relate to the local culture and systems, yet at the same time, are benchmarked with the best international standards. "To enable us go through the NABH assessment, we involved our entire hospital team who are well versed in managing quality programs on an ongoing basis. They studied the NABH requirements and made the necessary modifications in the processes where needed. No outside consultant or agency was hired for the assessment. It's an honour to receive the accreditation and the full credit goes to Team Manipal for this recognition." said Mr. Basil. The whole accreditation process which had been developed and implemented in house by Manipal Hospital reflects the capability, depth of knowledge, effectiveness and management commitment in driving an effective quality management system. Strong emphasis was laid on strengthening policies, procedures and protocols, reviewing performance through patient satisfaction, conducting audits and training the staff including clinicians, nursing, management and outsourced staff. Manipal Health Systems is one of the key enterprises that emerged from the dream of the great visionary, Padamashree Dr. TMA Pai. Together with Manipal University the group offers Tertiary, Secondary and Primary healthcare delivery services from 17 hospitals, 9 primary Care Clinics and 55 community Health Programs. With over 7000 beds, 1700 doctors, 15Lac Out-Patients & 4 Lac inpatients annually, and a rich history of over 50 years, it is today one of the largest healthcare delivery systems in Asia.